The first day of fighting at the Battle of Gettysburg (at McPherson’s Ridge, Oak Hill, Oak Ridge, Seminary Ridge, Barlow’s Knoll and in and around the town) involved some 50,000 soldiers of which roughly 15,500 were killed, wounded, captured or missing. The initial day in itself ranks as the 12th bloodiest battle of the Civil War. The Confederates would secure Seminary Ridge on the 1st and then use it as a staging area for assaults on Union positions on the second and third days of the fight at Gettysburg. After Seminary Ridge was contested and won by the Confederates on July 1, Gen. Robert E. Lee established his headquarters on the ridge just north of the Chambersburg pike. The ridge would now serve as the Confederate line of battle for attacks against Union positions on Cemetery Ridge during July 2-3. As a result of Federal artillery fire on the final day of fighting, July 3, 500 soldiers from George Pickett's division were killed or wounded on Seminary Ridge (including 88 lost in one regiment of Kemper's Brigade). Seminary Ridge was one of the few locations on the Gettysburg battlefield that saw action each of the three days. Having concentrated his army around the small town of Gettysburg, Gen. Robert E. Lee awaited the approach of Union Gen. George G. Meade’s forces. On July 1, early Union success faltered as Confederates pushed back against the Iron Brigade and exploited a weak Federal line at Barlow’s Knoll. 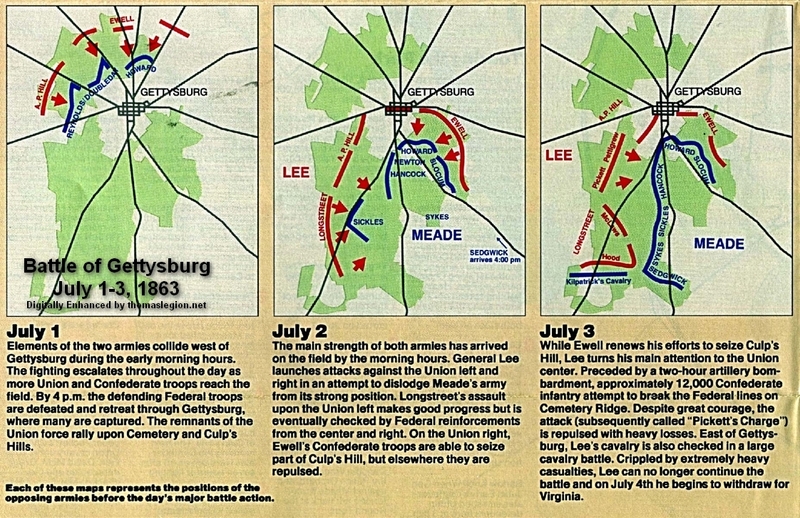 The following day saw Lee strike the Union flanks, leading to heavy battle at Devil's Den, Little Round Top, the Wheatfield, Peach Orchard, Culp’s Hill and East Cemetery Hill. Southerners captured Devil’s Den and the Peach Orchard, but ultimately failed to dislodge the Union defenders. On the final day, July 3rd, fighting raged at Culp’s Hill with the Union regaining its lost ground. 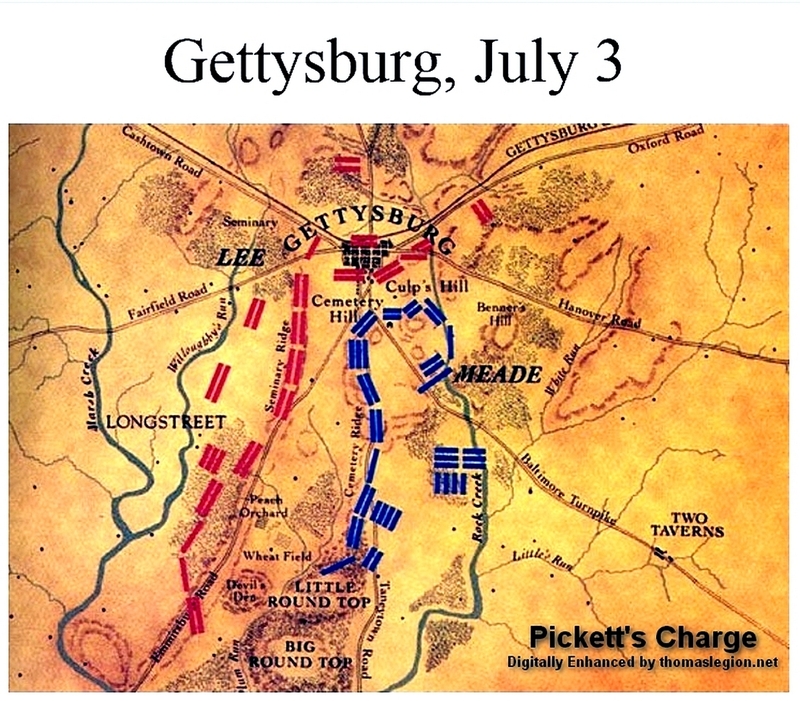 After being cut down by a massive artillery bombardment in the afternoon, Lee attacked the Union center on Cemetery Ridge and was repulsed in what is now known as Pickett’s Charge. Lee's second invasion of the North had failed, and had resulted in heavy casualties; an estimated 51,000 soldiers were killed, wounded, captured, or listed as missing after Gettysburg. After it was secured on the first day, Seminary Ridge became the primary Confederate position west of Gettysburg for the final two days of the battle. Named for the Lutheran Theological Seminary that overlooks Gettysburg from its northern point, the ridge runs southward to the Millerstown Road where it becomes Warfield Ridge. This latter ridge extends further southward, turns to the southeast and intersects the Emmitsburg Road. For General Lee, this ridge offered him high ground for observation of the distant Union line and an excellent artillery position to bombard Union positions on Cemetery Hill. Seminary Ridge also offered his troops cover from prying Union eyes, acting as a barrier for him to shift his troops north, south, or against the Union line. On the evening of July 1st, General A. P. Hill aligned the tired infantrymen of his corps along this ridge and these troops occupied it throughout the remainder of the battle. The guns in this photograph stand in an area south of the McMillan Farm. Infantry fighting did not extend up to this location on July 2, but batteries here supported the Confederate attack on Cemetery Ridge, approximately one mile distant. (Right) Tree cover on Seminary Ridge concealed Confederate troops and artillery from view until the attack began. Photo Gettysburg NMP. Early on the morning of July 2nd, Lee's Army of Northern Virginia was positioned on Seminary Ridge and extended northward, through Gettysburg and then east on the Hanover Road. Meade's Army of the Potomac occupied Culp's and Cemetery Hills, with his line extended southward on Cemetery Ridge toward Little Round Top. The U-shaped lines of both armies matched each other. General Lee still held an advantage in numbers that morning and decided to move his troops into positions to strike at Meade from both flanks. General James Longstreet's Corps was ordered southward toward the southern tip of the Confederate line to attack the Union left flank near the Round Tops. Once Longstreet's troops were engaged, General Ewell would send his Confederates against Culp's Hill and Cemetery Hill on the Union right flank. General A.P. Hill's Corps was positioned between the two other corps and remained on Seminary Ridge at this location. Hill's men were ordered to lay in reserve until they were needed to support the attack, though heavy skirmishing with Union troops took place in the fields west of the ridge throughout the day. Darkness called a halt to the Confederate assault before the last of Hill's troops could be called into battle. (About) Photo of Cemetery Ridge from Seminary Ridge at the McMillan Farm. Little & Big Round Top are to the right. Gettysburg NMP. It was from this location at Cemetery Ridge on July 3, that Confederates commanded by Generals Pettigrew and Trimble stepped off to participate in the attack on the Union center. Though this attack is called "Pickett's Charge", it was not just Virginia troops under General Pickett who made the assault- regiments from North Carolina, Alabama, Tennessee, and Mississippi made up the column that marched from this area. The long treeless slope ahead of the Confederates offered no cover from the withering Union cannon fire on Cemetery Hill and Cemetery Ridge. When the left brigade of Pettigrew's line began to crumble and retreat, General Trimble pushed his two brigades to the left to fill the gap. The men marched on to the Emmitsburg Road and assaulted the Union line north of the Angle. Like Pickett's men, they too were thrown back after considerable loss. Seminary Ridge today is marked by West Confederate Avenue, a park road designed and constructed at the turn of the century. It is lined with markers to Confederate brigades and artillery batteries accompanied by almost 80 artillery pieces, including many original guns of Confederate manufacture, that mark the general locations of Confederate units during the battle. The majority of monuments erected by Southern states are located on West Confederate Avenue, most notably the North Carolina and Tennessee monuments, Florida, Georgia, Mississippi, South Carolina, and Arkansas monuments, and the Virginia Monument, which has the equestrian statue of General Lee. The battle began early on the morning of July 1 when a Confederate column under General Henry Heth, marching east from Cashtown encountered Union pickets three miles west of Gettysburg. Opponents sparred over the gently rolling farmland west of Gettysburg, until the cavalrymen were forced back to McPherson's Ridge where Union infantry were just then arriving at 10 a.m.
On the morning of July 1, Union cavalry in the division of Brig. Gen. John Buford were awaiting the approach of Confederate infantry forces from the direction of Cashtown, to the northwest. Confederate forces from the brigade of Brig. Gen. J. Johnston Pettigrew had briefly clashed with Union forces the day before but believed they were Pennsylvania militia of little consequence, not the regular army cavalry that was screening the approach of the Army of the Potomac. General Buford realized the importance of the high ground directly to the south of Gettysburg. He knew that if the Confederates could gain control of the heights, Meade's army would have a hard time dislodging them. He decided to utilize three ridges west of Gettysburg: Herr Ridge, McPherson Ridge, and Seminary Ridge (proceeding west to east toward the town). These were appropriate terrain for a delaying action by his small division against superior Confederate infantry forces, meant to buy time awaiting the arrival of Union infantrymen who could occupy the strong defensive positions south of town, Cemetery Hill, Cemetery Ridge, and Culp's Hill. Early that morning, Reynolds, who was commanding the Left Wing of the Army of the Potomac, ordered his corps to march to Buford's location, with the XI Corps (Maj. Gen. Oliver O. Howard) to follow closely behind. (About) On the morning of July 1, a Union cavalry division under Brig. Gen. John Buford was awaiting the approach of Confederate infantry from the direction of Cashtown, to the northwest. Buford realized the importance of the high ground directly to the south of Gettysburg and knew that if the Confederates could gain control of the heights, Meade's army would have a hard time dislodging them. Buford decided to utilize three ridges west of Gettysburg: Herr Ridge, McPherson Ridge, and Seminary Ridge (proceeding west to east toward the town). It was appropriate ground for a delaying action by his small division against superior Confederate infantry forces. Confederate Maj. Gen. Henry Heth's division, from Lt. Gen. A.P. Hill's Third Corps, advanced towards Gettysburg. Heth deployed no cavalry and led, unconventionally, with the artillery battalion of Major William J. Pegram. Two infantry brigades followed, commanded by Brig. Gens. James J. Archer and Joseph R. Davis, proceeding easterly in columns along the Chambersburg Pike. Three miles west of town, about 7:30 a.m., Heth's two brigades met light resistance from cavalry vedettes and deployed into line. Eventually, they reached dismounted troopers from Col. William Gamble's cavalry brigade. The first shot of the battle was claimed to be fired by Lieutenant Marcellus E. Jones of the 8th Illinois Cavalry, fired at an unidentified man on a gray horse over a half-mile away; the act was merely symbolic. Buford's 2,748 troopers would soon be faced with 7,600 Confederate infantrymen, deploying from columns into line of battle. Gamble's men mounted determined resistance and delaying tactics from behind fence posts with rapid fire from their breech-loading carbines. It is a modern myth that they were armed with multi-shot repeating carbines. Nevertheless, they were able to fire two or three times faster than a muzzle-loaded carbine or rifle. Also, the breech-loading design meant that Union troops did not have to stand to reload and could do so safely behind cover. This was a great advantage over the Confederates, who still had to stand to reload, thus providing an easier target. But this was so far a relatively bloodless affair. By 10:20 a.m., the Confederates had reached Herr Ridge and had pushed the Federal cavalrymen east to McPherson Ridge, when the vanguard of the I Corps finally arrived, the division of Maj. Gen. James S. Wadsworth. The troops were led personally by Gen. Reynolds, who conferred briefly with Buford and hurried back to bring more men forward. (Right) Once the Confederates secured Seminary Ridge on the 1st, it would be used as a staging area for assaults on Union positions on the second and third days of the fight at Gettysburg. The morning infantry fighting occurred on either side of the Chambersburg Pike, mostly on McPherson Ridge. To the north, an unfinished railroad bed opened three shallow cuts in the ridges. To the south, the dominant features were Willoughby Run and Herbst Woods (sometimes called McPherson Woods, but they were the property of John Herbst). Brig. Gen. Lysander Cutler's Union brigade opposed Davis's brigade; three of Cutler's regiments were north of the Pike, two to the south. To the left of Cutler, Brig. Gen. Solomon Meredith's Iron Brigade opposed Archer. General Reynolds directed both brigades into position and placed guns from the Maine battery of Capt. James A. Hall where Calef's had stood earlier. While the general rode his horse along the east end of Herbst Woods, shouting "Forward men! Forward for God's sake, and drive those fellows out of the woods," he fell from his horse, killed instantly by a bullet striking him behind the ear. (Some historians believe Reynolds was felled by a sharpshooter, but it is more likely that he was killed by random shot in a volley of rifle fire directed at the 2nd Wisconsin.) Maj. Gen. Abner Doubleday assumed command of the I Corps. 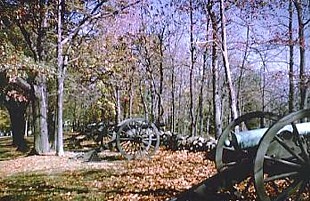 On the right of the Union line, three regiments of Cutler's brigade were fired on by Davis's brigade before they could get into position on the ridge. 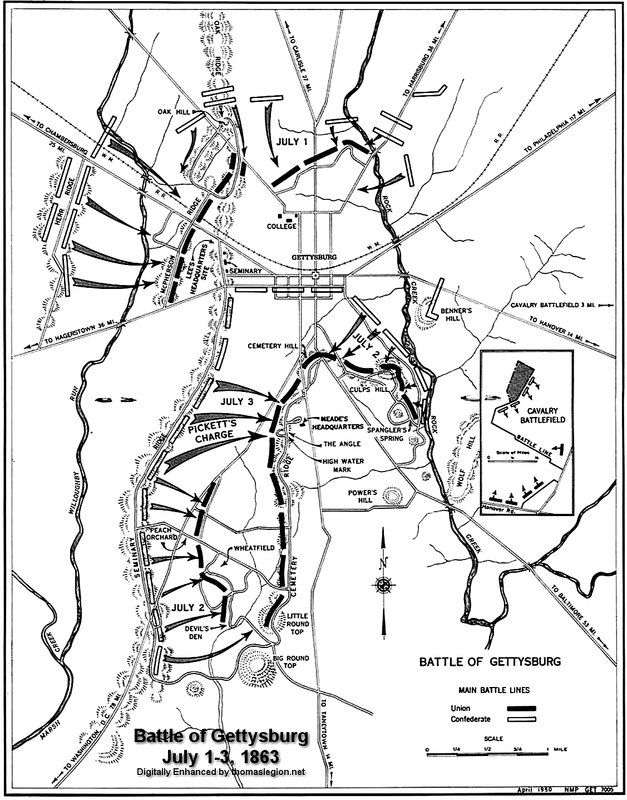 Davis's line overlapped the right of Cutler's, making the Union position untenable, and Wadsworth ordered Cutler's regiments back to Seminary Ridge. The commander of the 147th New York, Lt. Col. Francis C. Miller, was shot before he could inform his troops of the withdrawal, and they remained to fight under heavy pressure until a second order came. In under 30 minutes, 45% of Gen. Cutler's 1,007 men became casualties, with the 147th losing 207 of its 380 officers and men. Some of Davis's victorious men turned toward the Union positions south of the railroad bed while others drove east toward Seminary Ridge. This defocused the Confederate effort north of the pike. In the afternoon, there was fighting both west (Hill's Corps renewing their attacks on the I Corps) and north (Ewell's Corps attacking the I and XI Corps) of Gettysburg. Ewell, on Oak Hill with Rodes, saw Howard's troops deploying before him, and he interpreted this as the start of an attack and implicit permission to set aside Gen. Lee's order not to bring about a general engagement. Rodes initially sent three brigades south against Union troops that represented the right flank of the I Corps and the left flank of the XI Corps: from east to west, Brig. Gen. George P. Doles, Col. Edward A. O'Neal, and Brig. Gen. Alfred Iverson. Doles's Georgia brigade stood guarding the flank, awaiting the arrival of Early's division. Both O'Neal's and Iverson's attacks fared poorly against the six veteran regiments in the brigade of Brig. Gen. Henry Baxter, manning a line in a shallow inverted V, facing north on the ridge behind the Mummasburg Road. O'Neal's men were sent forward without coordinating with Iverson on their flank and fell back under heavy fire from the I Corps troops. Baxter's brigade was worn down and out of ammunition. At 3:00 p.m. he withdrew his brigade, and Gen. Robinson replaced it with the brigade of Brig. Gen. Gabriel R. Paul. Rodes then committed his two reserve brigades: Brig. Gens. Junius Daniel and Dodson Ramseur. Ramseur attacked first, but Paul's brigade held its crucial position. Paul had a bullet go in one temple and out the other, blinding him permanently (he survived the wound and lived 20 more years after the battle). Before the end of the day, three other commanders of that brigade were wounded. Daniel's North Carolina brigade then attempted to break the I Corps line to the southwest along the Chambersburg Pike. They ran into stiff resistance from Col. Roy Stone's Pennsylvania "Bucktail Brigade" in the same area around the railroad cut as the morning's battle. Fierce fighting eventually ground to a standstill. Rodes's original faulty attack at 2:00 had stalled, but he launched his reserve brigade, under Ramseur, against Paul's Brigade in the salient on the Mummasburg Road, with Doles's Brigade against the left flank of the XI Corps. Daniel's Brigade resumed its attack, now to the east against Baxter on Oak Ridge. This time Rodes was more successful, mostly because Early coordinated an attack on his flank. In the west, the Union troops had fallen back to the Seminary and built hasty breastworks running 600 yards north-south before the western face of Schmucker Hall, bolstered by 20 guns of Wainwright's battalion. Dorsey Pender's division of Hill's Corps stepped through the exhausted lines of Heth's men at about 4:00 p.m. to finish off the I Corps survivors. The brigade of Brig. Gen. Alfred M. Scales attacked first, on the northern flank. His five regiments of 1,400 North Carolinians were virtually annihilated in one of the fiercest artillery barrages of the war, rivaling Pickett's Charge to come, but on a more concentrated scale. Twenty guns spaced only 5 yards apart fired spherical case, explosive shells, canister, and double canister rounds into the approaching brigade, which emerged from the fight with only 500 men standing and a single lieutenant in command. Scales wrote afterwards that he found "only a squad here and there marked the place where regiments had rested." The attack continued in the southern-central area, where Col. Abner M. Perrin ordered his South Carolina brigade (four regiments of 1,500 men) to advance rapidly without pausing to fire. Perrin was prominently on horseback leading his men but miraculously was untouched. He directed his men to a weak point in the breastworks on the Union left, a 50-yard gap between Biddle's left-hand regiment, the 121st Pennsylvania, and Gamble's cavalrymen, attempting to guard the flank. They broke through, enveloping the Union line and rolling it up to the north as Scales's men continued to pin down the right flank. By 4:30 p.m., the Union position was untenable, and the men could see the XI Corps retreating from the northern battle, pursued by masses of Confederates. 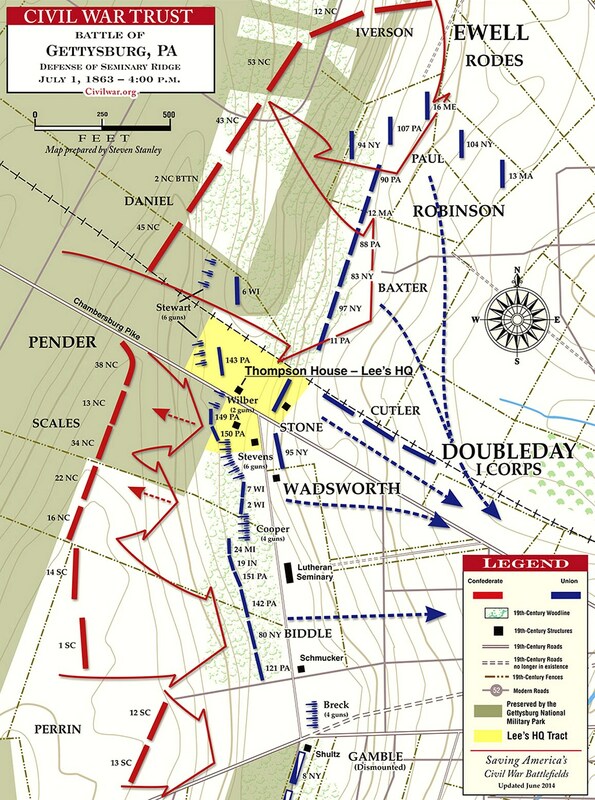 Doubleday ordered a withdrawal east to Cemetery Hill. On the southern flank, the North Carolina brigade of Brig. Gen. James H. Lane contributed little to the assault; he was kept busy by a clash with Union cavalry on the Hagerstown Road. Brig. Gen. Edward L. Thomas's Georgia Brigade was in reserve well to the rear, not summoned by Pender or Hill to assist or exploit the breakthrough. Union troops retreated in different states of order. The brigades on Seminary Ridge were said to move deliberately and slowly, keeping in control, although Col. Wainwright's artillery was not informed of the order to retreat and found themselves alone. When Wainwright realized his situation, he ordered his gun crews to withdraw at a walk, not wishing to panic the infantry and start a rout. As pressure eventually increased, Wainwright ordered his 17 remaining guns to gallop down Chambersburg Street, three abreast. A.P. Hill failed to commit any of his reserves to the pursuit of the Seminary defenders, a great missed opportunity. Near the railroad cut, Daniel's Brigade renewed their assault, and almost 500 Union soldiers surrendered and were taken prisoner. Paul's Brigade, under attack by Ramseur, became seriously isolated and Gen. Robinson ordered it to withdraw. He ordered the 16th Maine to hold its position "at any cost" as a rear guard against the enemy pursuit. The regiment, commanded by Col. Charles Tilden, returned to the stone wall on the Mummasburg Road, and their fierce fire gave sufficient time for the rest of the brigade to escape, which they did, in considerably more disarray than those from the Seminary. The 16th Maine started the day with 298 men, but at the end of this holding action there were only 35 survivors. For the XI Corps, it was a sad reminder of their retreat at Chancellorsville in May. Under heavy pursuit by Hays and Avery, they clogged the streets of the town; no one in the corps had planned routes for this contingency. Hand-to-hand fighting broke out in various places. Parts of the corps conducted an organized fighting retreat, such as Coster's stand in the brickyard. The private citizens of Gettysburg panicked amidst the turmoil, and artillery shells bursting overhead and fleeing refugees added to the congestion. Some soldiers sought to avoid capture by hiding in basements and in fenced backyards. Gen. Alexander Schimmelfennig was one such person who climbed a fence and hid behind a woodpile in the kitchen garden of the Garlach family for the rest of the three-day battle. The only advantage that the XI Corps soldiers had was that they were familiar with the route to Cemetery Hill, having passed through that way in the morning; many in the I Corps, including senior officers, did not know where the cemetery was located. When Hancock arrived on Cemetery Hill, he met with Howard and they had a brief disagreement about Meade's command order. As the senior officer, Howard yielded only grudgingly to Hancock's direction. Although Hancock arrived after 4:00 p.m. and commanded no units on the field that day, he took control of the Union troops arriving on the hill and directed them to defensive positions with his "imperious and defiant" (and profane) persona. 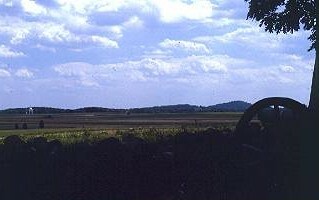 As to the choice of Gettysburg as the battlefield, Hancock told Howard "I think this the strongest position by nature upon which to fight a battle that I ever saw." When Howard agreed, Hancock concluded the discussion: "Very well, sir, I select this as the battle-field." Brig. Gen. Gouverneur K. Warren, chief engineer of the Army of the Potomac, inspected the ground and concurred with Hancock. The first day at Gettysburg—more significant than simply a prelude to the bloody second and third days—ranks as the 23rd biggest battle of the war by number of troops engaged. About one quarter of Meade's army (22,000 men) and one third of Lee's army (27,000) were engaged. Union casualties were almost 9,000, Confederate slightly more than 6,000. Major General Isaac R. Trimble accompanied the Army of Northern Virginia northward to Gettysburg without troops to command though he was an experienced officer having previously served under "Stonewall" Jackson in the Shenandoah Valley and at Second Manassas where he had been wounded. Reorganization of the army after Chancellorsville left the general without troops to command, so he rode with the army attached to General Ewell's headquarters, a role he was evidently dissatisfied with and expressed his displeasure to General Lee. As fate would have it, the injury to General William Dorsey Pender on July 2nd left a vacancy that Trimble could fill and he was assigned to command Pender's Division in the great attack on the Union center known as "Pickett's Charge." Unfortunately, Trimble's tenure in command was short. He was seriously wounded near the Emmitsburg Road during the charge when a musket ball slammed into his leg, shattering the bone. He relinquished command with the remark: "If the troops (I) had the honor to command today for the first time cannot take that position, all hell can not take it!" That night, the general's leg was amputated in a Confederate field hospital. Captured when the Confederate army retreated, the general convalesced in a Federal hospital for prisoners in Philadelphia. Trimble was exchanged in 1865 but his career as a field officer was finished. After the close of the war, he returned to the city of Baltimore where he had previously been employed as general superintendent of the Baltimore and Potomac Railroad, and lived a quiet life as a consulting engineer until his death in 1888. The North Carolina Monument is dedicated to its forty-two regiments and batteries which served at Gettysburg. The North Carolina legislature appointed a special commission of veterans to visit the battlefield park in 1913 and return with a design proposal for a state monument to be place there, but the advent of World War I put the state's plans on hold. It was not until 1927 when the plan was rekindled by the North Carolina Chapter of the United Daughters of the Confederacy and Governor Angus McLean. The state appropriated $50,000 to purchase the site, contract with an artist for the design and manufacture, and provide landscape features as an appropriate setting. (Right) North Carolina Monument. Gettysburg NMP. Dedicated on July 3, 1929, the North Carolina Monument is the work of world re-known sculptor Gutzon Borglum (1867-1941) whose most famous work is the four presidents on Mount Rushmore. 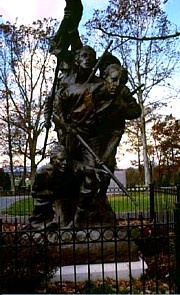 The monument represents a group of North Carolina soldiers in "Pickett's Charge". Fifteen North Carolina infantry regiments, all of which had suffered heavily during the first day's battle, participated in the attack. The monument is accompanied by dogwoods, which is the state tree, and a stone monolith that lists the North Carolina commands present at Gettysburg. The state's sacrifice at the Battle of Gettysburg was humbling; one in every four Confederate soldiers who fell here was from the "Old North State". Cemetery Ridge was unoccupied for much of the first day until the Union army retreated from its positions north of town, when the divisions of Brig. Gen. John C. Robinson and Maj. Gen. Abner Doubleday from the I Corps were placed on the northern end of the ridge, protecting the left flank of the XI Corps on Cemetery Hill. After the XII Corps arrived, Maj. Gen. John W. Geary's Second Division was sent to the southern end of the ridge near Little Round Top; Brig. Gen. John Buford's cavalry division formed a skirmish line in the fields between Cemetery Ridge and Seminary Ridge. The III Corps arrived about 8 p.m. and replaced Geary's division (which was sent to Culp's Hill); the II Corps arrived about 10:30 p.m. and camped immediately behind the III Corps. 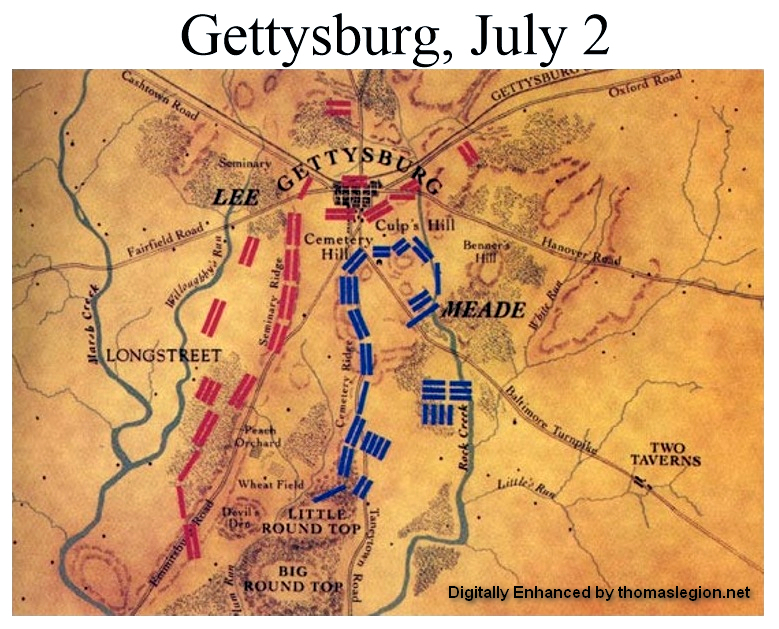 During the morning of the battle's 2nd day (July 2), Army of the Potomac commander Maj. Gen. George G. Meade shifted units to receive an expected Confederate attack on his positions. 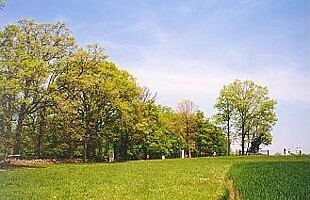 The II Corps was placed in the center of Cemetery Ridge, with Brig. Gen. Alexander Hays's division on the corps' right, John Gibbon's division in the center around the Angle, and John C. Caldwell's division on the left, adjacent to the III Corps; Robinson's division of the I Corps was placed in reserve behind the XI Corps. The V Corps was formed in reserve behind the II Corps. In the late afternoon, the end of the Confederate Maj. Gen. Lafayette McLaws's assault drove portions of Maj. Gen. Daniel Sickles's III Corps line back to the southern end of Cemetery Ridge, and Brig. Gen. Ambrose Wright's Confederate brigade temporarily captured the southern end of the Angle before being driven back to Seminary Ridge by the Philadelphia Brigade. The Confederate artillery bombardment preceding Pickett's Charge on July 3 battered Cemetery Ridge, and Union artillery on the ridge counterfired to Seminary Ridge. Thirty-four Union cannons were disabled, but the three Confederate divisions of the subsequent infantry assault (Pickett's of the First Corps and Pettigrew's and Trimble's of the Third Corps), attacked the Union II Corps at the "stone fence" at the Angle. Heavy rifle and artillery fire prevented all but about 250 Confederates led by Lewis Armistead from penetrating the Union line to the high water mark of the Confederacy. Armistead was mortally wounded. Two brigades of Anderson's Division, assigned to protect Pickett's right flank during the charge, reached a more southern portion of the Union line at Cemetery Ridge soon after the repulse of Pickett's Division, but were driven back with 40% casualties by the 2nd Vermont Brigade. Lee then led his battered army on a torturous retreat back to Virginia, where he would remain for the duration of the war. While as many as 51,000 soldiers from both armies were killed, wounded, captured or missing in the three-day battle, its strategy and tactics are still being studied from casual students to elite schools such as West Point. Sources: National Park Service; Gettysburg National Military Park; Civil War Trust; National Archives; Library of Congress; Official Records of the Union and Confederate Armies. 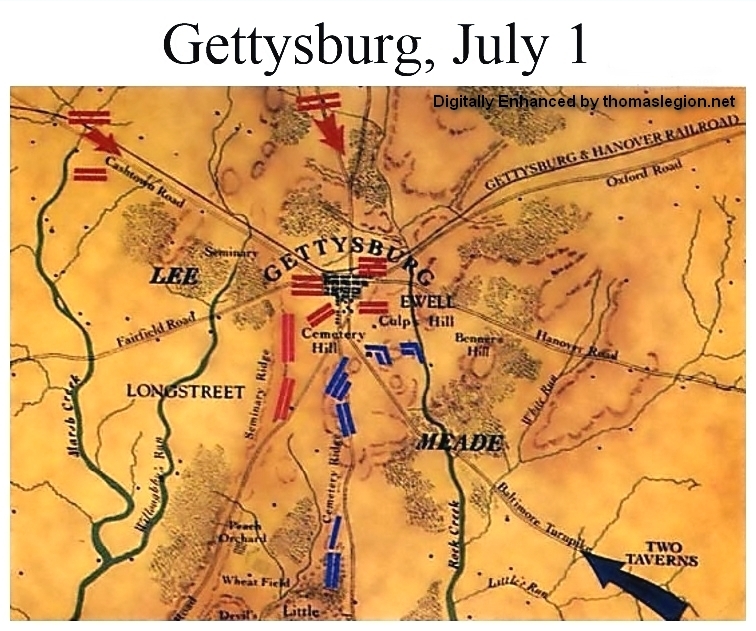 After sketching the background of the Gettysburg campaign and recounting the events immediately preceding the battle, Pfanz offers a detailed tactical description of the first day's fighting. He describes the engagements in McPherson Woods, at the Railroad Cuts, on Oak Ridge, on Seminary Ridge, and at Blocher's Knoll, as well as the retreat of Union forces through Gettysburg and the Federal rally on Cemetery Hill. Throughout, he draws on deep research in published and archival sources to challenge some of the common assumptions about the battle--for example, that Richard Ewell's failure to press an attack against Union troops at Cemetery Hill late on the first day ultimately cost the Confederacy the battle. Battle of Gettysburg : Cemetery or Seminary Hill? Recommended Reading: Gettysburg--The Second Day, by Harry W. Pfanz (624 pages). Description: The second day's fighting at Gettysburg—the assault of the Army of Northern Virginia against the Army of the Potomac on 2 July 1863—was probably the critical engagement of that decisive battle and, therefore, among the most significant actions of the Civil War. Harry Pfanz, a former historian at Gettysburg National Military Park, has written a definitive account of the second day's brutal combat. He begins by introducing the men and units that were to do battle, analyzing the strategic intentions of Lee and Meade as commanders of the opposing armies, and describing the concentration of forces in the area around Gettysburg. He then examines the development of tactical plans and the deployment of troops for the approaching battle. But the emphasis is on the fighting itself. Pfanz provides a thorough account of the Confederates' smashing assaults—at Devil's Den and Little Round Top, through the Wheatfield and the Peach Orchard, and against the Union center at Cemetery Ridge. He also details the Union defense that eventually succeeded in beating back these assaults, depriving Lee's gallant army of victory. Continued below. Recommended Reading: Gettysburg--Culp's Hill and Cemetery Hill (Civil War America) (Hardcover). Description: In this companion to his celebrated earlier book, Gettysburg—The Second Day, Harry Pfanz provides the first definitive account of the fighting between the Army of the Potomac and Robert E. Lee's Army of Northern Virginia at Cemetery Hill and Culp's Hill—two of the most critical engagements fought at Gettysburg on 2 and 3 July 1863. Pfanz provides detailed tactical accounts of each stage of the contest and explores the interactions between—and decisions made by—generals on both sides. In particular, he illuminates Confederate lieutenant general Richard S. Ewell's controversial decision not to attack Cemetery Hill after the initial southern victory on 1 July. Continued below. Pfanz also explores other salient features of the fighting, including the Confederate occupation of the town of Gettysburg, the skirmishing in the south end of town and in front of the hills, the use of breastworks on Culp's Hill, and the small but decisive fight between Union cavalry and the Stonewall Brigade. About the Author: Harry W. Pfanz is author of Gettysburg--The First Day and Gettysburg--The Second Day. A lieutenant, field artillery, during World War II, he served for ten years as a historian at Gettysburg National Military Park and retired from the position of Chief Historian of the National Park Service in 1981. To purchase additional books from Pfanz, a convenient Amazon Search Box is provided at the bottom of this page. She writes, "From the time the battle smoke cleared, Pickett's Charge took on this chameleon-like aspect and, through a variety of carefully constructed nuances, adjusted superbly to satisfy the changing needs of Northerners, Southerners, and, finally, the entire nation." With care and detail, Reardon's fascinating book teaches a lesson in the uses and misuses of history.